Shatin noted that when writing she was “fueled by my rage and sadness at the burning that has erupted around us. One is hardpressed to keep track of it all. The past decade has been an era of renewed holocausts driven by ethnic and religious hatred. 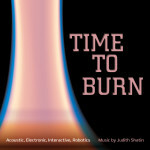 The rampant intolerance in our world is reminiscent of the ‘burning time’ of the Inquisition or the burning of witches.” The sheet music is also available for purchase at judithshatin.com/time-to-burn.